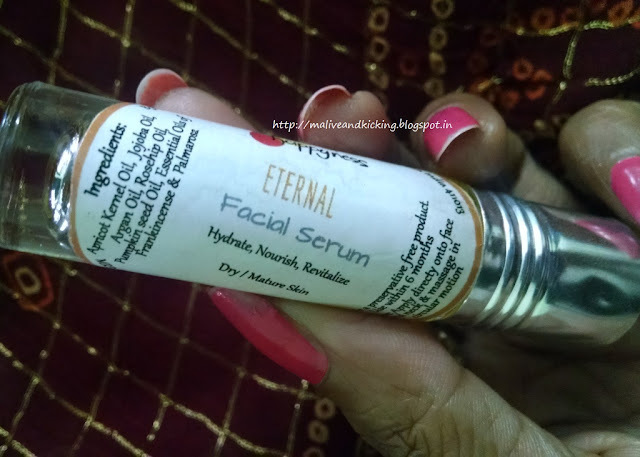 My skin care regimen has got a new product integrated into it for some time and that is a 'Face Serum'. 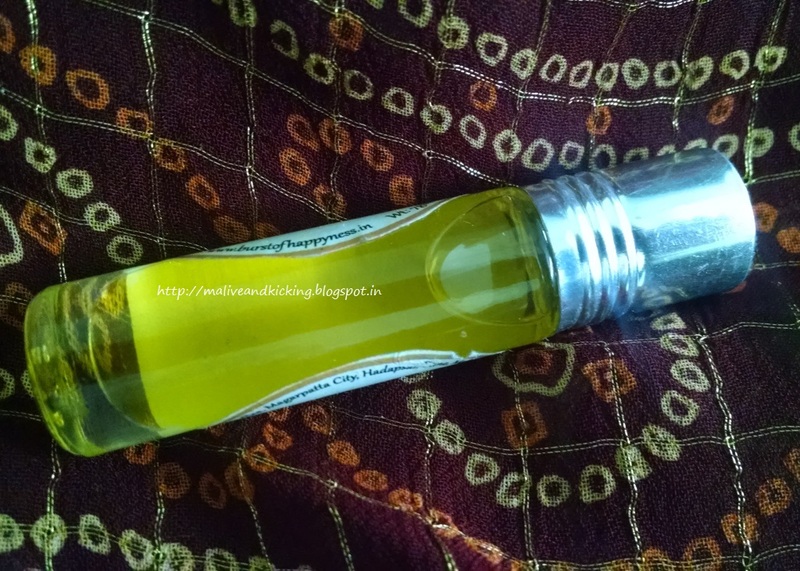 I've been eager to try one after reading excellent reviews and got an opportunity to use a herbal blend of nourishing oils aiming at hydrating and revitalizing dryness-prone skin which is also perfect to combat signs of ageing. The product is called Eternal Face Serum by Burst of Happyness. What is the product made up of? 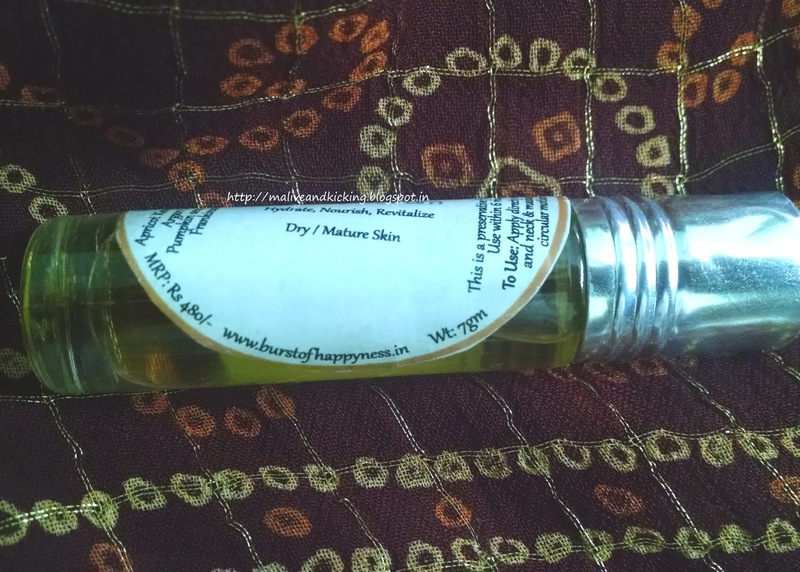 The serum comes is a tiny cylindrical glass bottle which has roll-on tip. The bottle has silver screw cap. The serum can directly be rubbed on face by rolling the bottle tip on skin and then using your hand to massage. 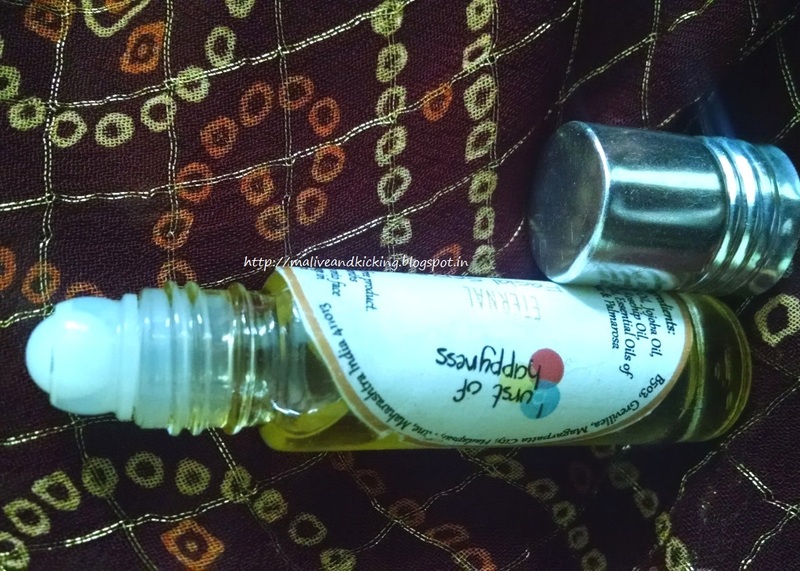 Burst of Happyness Eternal Face Serum is a golden yellow colored oil that is a blend of natural plant oils and essential oils. It is purely vegan in nature and free of chemicals. Being a roll-on bottle, it ensures no wastage of product. Infact you need not to measure the exact number of drops to be used in single use and can just keep rubbing on your face to give complete coverage. The light-weight formula sinks into my dry skin quickly and feels completely non-sticky. It gives a shine upon application that settles as you massage the serum till deep penetration. The serum functions as lightweight moisturizers that have no thickeners in them rather they boost overall skin health when used morning and evening. I prefer applying it post shower and before bedtime. Remember to layer it up with a good sunscreen in the daytime to avoid sun damage, as the serum's efficacy would double up. 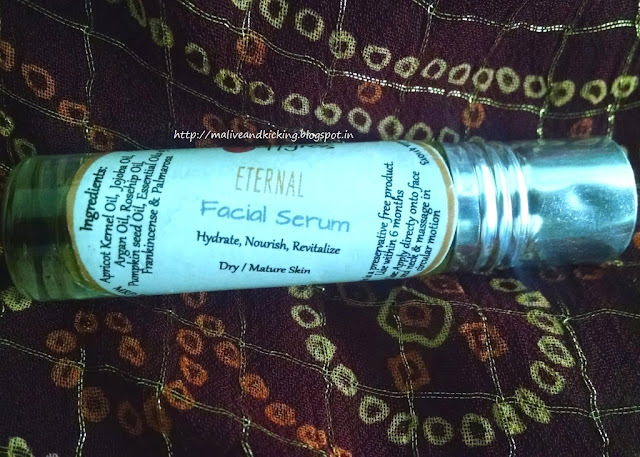 Using a facial serum is not to replace a moisturizer but simply an added step to have the right skin type. Since the serums offer light moisturization, the people with extreme dry skin should continue applying their usual daytime and nighttime moisturizer to replenish skin's hydration. 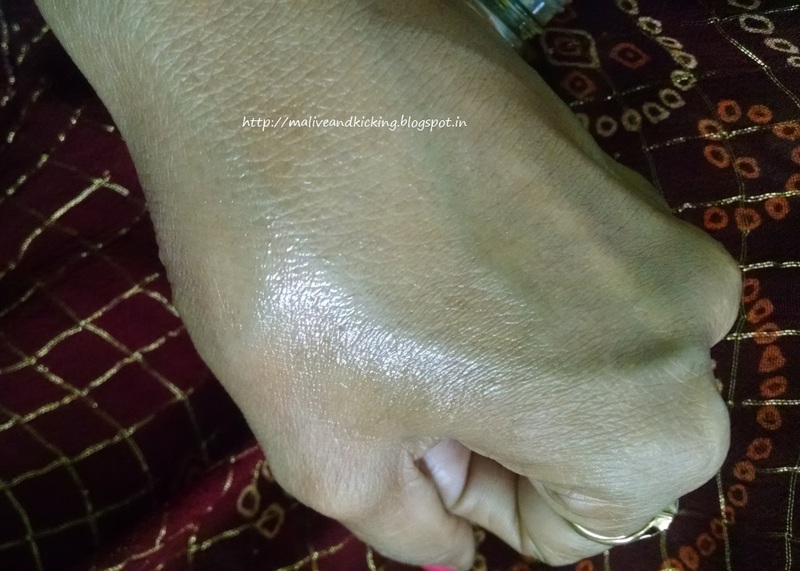 While I noticed good improvement in my skin texture after using it for a month, it will surely make the skin firm, toned and youthful in long term with impressive ingredients. Also I enjoy the instant softness and dampness within the skin every time I use the serum. In the end, I would suggest to choose a serum addressing your skin concerns and matching your skin type to procure best results. Talking about the herbal compositions by Burst of Happyness, Eternal is loaded with rich plant oils, whereas Divine is another variant for oily+acne prone skin type. The serum is well concentrated, so a little goes a long way. The 7gm of liquid can serve around 30-40 application, so would last for more than a month of continuous use. 12 months of date of manufacture printed on the product pack or 6 months after opening. Can be refrigerated to increase its shelf life. I have used just this one, so can't compare. but this is a good one . Thats great. Do share the recipe of the serum when u make.